Peter Gowland designed and built cameras that no one else designed and built and from looking over his creations, your intuition may be that these were ones he needed for his own photography, couldn't find in the market place, so he created them. The Pocket View fights with the Toho 45 for the distinction of being the lightest weight 4x5 metal monorail with full movements. Over the years there have been many variations, including ones that he licensed to other manufacturers. The variations tend to be in the selection of movements that the models support and in back design. There has also been a gradual evolution of the design, the sophistication of movements, the operation of features and weight, so it is important that you read this review as a single instance in all of that variation. In both manufacturing and use, the Pocket View is a modular design. Each camera is assembled with the desired features from an inventory of parts that are created to be interchangeable and to integrate within obvious limits. These shots were taken before the conversion of the front standard to accept Wista lensboards. The Pocket View, like most other lightweight large format cameras, balances convenience, precision, features and metrics against cost and weight. With the Pocket View, it may take a bit longer to adjust and compose because front tilt and rise/fall are controlled by the same two knobbed set screws through the slotted standard into the threaded lensboard frame. Front shift and swing are controlled by the another single screw into the front mount bracket. (Note that the top-of-the-line All Moves currently has separate controls.). The only thing resembling a geared movement is the front focusing mount. The rails of Pocket Views differ in diameter in length, but they are of two parts--a slotted solid 3/8- or 1/2-inch rod joined by the tripod mount to an unslotted solid rod. The rear standard mount can rotate on the rail; the front can't so they can get out of square. When adjusting the rear standard you must visually assure that it is square with the front standard as you tighten the rear rail mount. Since all the contact points for movements rely on metal-on-metal friction,when you are generally satisfied with your composition, it is important to recheck the camera configuration and recheck the adjusting knobs to verify that your adjustments are as you intended. For your setup effort, you are rewarded with a 3-4 lb. LF camera with complete movements in generous ranges. Once locked down, the Pocket View has good stability. The tradeoff for this rather basic mechanical construction, sometimes a critical one, is that you can carry this camera, a couple of Grafmatics and a couple of lightweight lenses around a city for a half day or hike up a tall mountain with this kit and have complete perspective and DOF zone control without coming away from the experience with a dislocated shoulder. Virtually all Pocket Views use a standard coin-in-slot friction type focusing mechanism, which I believe first appeared on the WWII vintage Kodak 4x5 Master View--a design later sold to Calumet. The focusing mount can be adjusted for balance between effort and stability. The Pocket View's focusing mechanism is on the front standard, but the position of both standards on the rail can be adjusted so that the rail can be kept out of the field of view when using very wide lenses. The rear standard can be adjusted on the rear section of the rail to control overall extension, but this adjustment would typically be made when switching between lenses of different lengths. Since the rail is an aluminum rod, it is possible to have low cost alternative rails for different configurations. Rail section length can vary from 6 to 9 inches, and perhaps bellows extension has varied as well. My Calumet Pocket View has a working extension of about 12 1/2 inches, though the bellows are not fully extended, and expect another 50-75mm of extension would be possible with a longer rear rail section. Standards height also vary across models. Most, if not all Pocket Views support all movements on the front standard (though perhaps Peter was the only one qualified to make inclusive claims about the Pocket View). The less expensive current Gowland model has all front movements, with back base tilt, while the more expensive models include rear shift, rise/fall and axis tilts. Peter did offer an entry level model with a fixed rear standard with front movements. On earlier versions, standards movements were secured by Allen head screws. Current models have more convenient machine screws with handles, and since bolt sizes and threads are not esoteric, upgrades are as easy as a trip to a good hardware store or by mail order from Gowland. There are no detents and not even center point lines for adjusting movements, though these are easy to add with a fine tip paint pen. My Pocket View is one licensed to Calumet. Its principle difference from the current Gowland "All Moves" models is in the back design. The Gowland models have direct rise/fall, not supported on the Calumet model. The Gowland models have a reversible international G back, while the Calumet Pocket View has a lightweight Calumet/Cambo rotating G back. The Calumet/Cambo with interchangeable bellows fixtures on the front and rear standards allow very lightweight bellows assemblies that can be swapped quickly without altering the camera structure. The Gowland bellows are attached to frame structures that are heavier and more complicated to swap. The rotating back and bellows design of Calumet Pocket View are features that make it quicker and safer to use. The Calumet has lever controls for the rear tilt adjustment that are convenient, but make the body much more awkward to pack; the Gowlands have flat knurled controls. There are currently two Gowland "all moves" models, one with slotted flat standards legs on front and rear, and the other (shown at the top of the page) with upright aluminum rods on which standards clamps rise and fall, much like the long-established Calumet/Cambo monorail design. The latter model has separate locking knobs for rise/fall and tilt. The Calumet Pocket View, because it has a standard Cambo back, accepts the Cambo reflex viewers. 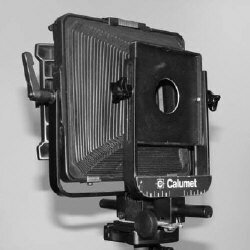 The Calumet Pocket View uses a 3 3/4 inch square aluminum lensboard that is secured by Allen head screws on the top and bottom of the lens frame and the knobbed screws that set the tilt and rise/fall movements on the left and right. 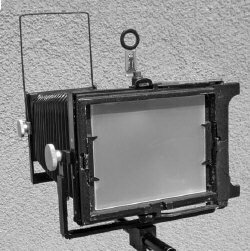 This non-standard lensboard doesn't recommend the Calumet version, if you expect to add it to an existing collection of LF equipment; shutter size is probably limited to a #2 or smaller on the Calumet version. 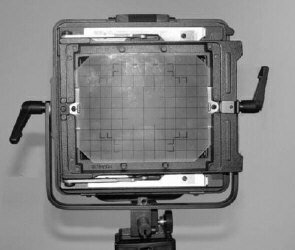 The Gowland versions, however, are available with lens board frames and front standards for 4x4 lens boards, Technika/Wista boards or 5 x 5 boards. This allows you to pair up the Gowland Pocket View with many other technical and monorail cameras so that they can share a common lens pool. Upgrading the front standard and lens frame to the Wista version was straightforward and quick. The pleated bellows of my Calumet Pocket View are tapered and rather stiff, making use with lenses shorter than 90mm difficult. To use my shorter lenses on the Pocket View, I have attached another Gowland Wista lensboard frame to the front of a Cambo wide angle bellows--more a jumbo sized folded leather pleated bellows than a bag bellows--so that it attaches to the Gowland front standards. Since the front frame for a Cambo bellows is the same size as the back frame, I had to make an aluminum structure on the front of the Cambo bag bellows to reduce its size to that of the Wista lensboard frame. This was necessary so that in front tilt operations the lensframe pivots in a way that clears the front standard. 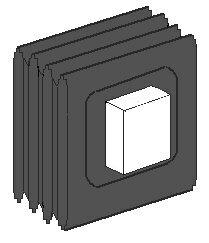 Gowland does offer a bag bellows that fits the current and some past models. It also has an attached lens frame that fits between the legs of the front standards. Switching lenses on the Gowland is not as easy as is on many other designs because at least three of the four screws must be backed out. Two of these screws are the locks for tilt and shift. An independent adjustable optical finder for initial framing is useful for lens choice. I use two separate finders--one from a Speed Graphic with three different masks and another Retina accessory optical finder that gives views for 35mm and 80mm supplementary Retina lenses. These finders are crude by the standards of modern Linhof and Horseman optical finders, but mine have a market value of perhaps $50, while the modern finders are several hundreds of dollars, even used. The range of standards movements of the Pocket View All-Movements versions is outstanding. Using either the bag or pleated bellows, the Pocket View can be used for architecture or tabletop work with lenses from 65 - 250mm. The Calumet version and the less expensive Gowland versions have about 11/2 inches of rise and fall with no direct rear rise and fall. It is most convenient to use the wide bellows for lenses shorter than 135mm, though some movements are possible with shorter lenses and the pleated bellows; movements with my 100 Wide Field Ektar with an image circle of 183mm are not limited by the pleated bellows, but taking advantage of the large image circles of the modern 90mm lenses would be frustrating. My experience with recessed Wista/Technika boards has been disappointing. My 100mm Wide Field Ektra is mounted in a Flash Supermatic No 1 shutter. There is not enough room in the Wista recessed board to attach a cable release, even with the versions made for recessed boards. This might not be a problem with newer #0 shutters used by many lenses. It would also probably not be a problem with the 4 x 4 recessed lensboards and certainly not the 5 x 5 boards. The 12 1/2 inch extension may be enough to focus some 300mm non-telephoto lenses at infinity. Extension tubes can be used for longer lenses, but the cantilever effect causes problems with the front tilt adjustment, since this is only controlled by a friction connection between the front standard and the lensboard frame. Both the Gowland and Calumet Pocket View models offer maximal flexibility with film holders--6 x 6, 6 x 7, 6 x 9, 6 x 12, 6 x 17 rollfilm plus 4 x 5 sheetfilm. 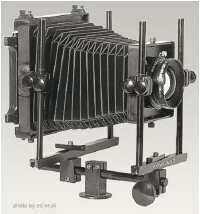 All Gowland models have standard Graflok type removeable focusing panels, but the sliding bars necessary to attach accessory backs--rollholders and instant film holders--must be ordered as an option. In conrast, many woodfield cameras and the lightweight Toho 4 x 5 monorail can accept only holders that fit under the focusing frame, limiting roll film use to many fewer types of rollholders. Pocket View shoppers and owners quickly learn the no-free-lunch principle. Those extra mechanisms that add features and precision in operations increase weight. 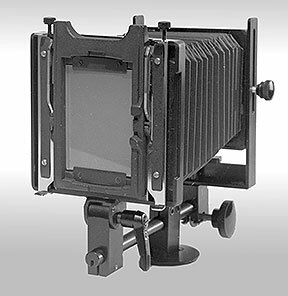 The original 4 x 5 Pocket View weighed about two pounds, but had simpler controls and a non-reversible back with a non-removable focusing panel; the current All Moves with Separate Tilt and Rise/Fall Controls weighs about four pounds. A primary virtue of the Pocket View design is that you can get what you are willing to carry and pay for. When travelling, the Pocket View can be broken down and can be about the same squareish bulk as a 4 x 5 technical or field camera. Except on an airplane, I find it most convenient to carry it set up, including the reflex viewer, in a medium sized plastic cooler bag with the rail sticking out. The camera, 135mm Wide Field Ektar, a Calumet reflex finder and the case weighs a little over 6 pounds. Set up this way only requires attaching the camera's QR plate to the tripod, ready for composition. In this form, it is bulkier than folding cameras, but weight about the same as the lightest and is lighter than most. For large format use, where maximum movements and minimal weight are the most important factors, the Pocket View has little competition in its price range. It has a greater range of movements than most woodfield cameras at about the same weight and is more rigid. It is lighter than most technical cameras while equaling or exceeding their range of movements. The only significant competition in the monorail market is the more expensive Toho at $1400. It uses base rather than axis tilts, has limited compatibility with rollholders, offers no bag bellows and is slower when switching image orientation; but it has a more sophisticated telescoping rail system. Some versions of the Pocket View are made for the 6 x 9 format. The version shown here at the left has a reversible back, all front movements and rear base tilts. A simpler version was offered with a fixed back. While you might think that the 5 x 7 and 8 x10 versions stretch the "pocket" concept, they extend the lightweight design to these formats with axis movements that are hard to find in flatbed designs. When I last talked to Peter in 2009, he was in his early 90s and still enthusiastic about camera design; he passed in March 2010. For a look at lives that span the better part of the recent photographic era, visit Alice's and Peter's Web site. As of April 2011, the Gowland camera business was still offering parts, service and some Gowland camera models. Contact information is on the Gowland site for prices and availability by phone, email and letter.